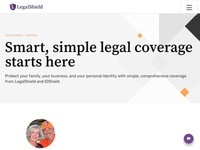 Legal Shield has been in business over 45 years providing families, individuals and businesses access to the Legal system starting at under $25 per month. We provide major Law Firms in 48 States and 4 provinces of Canada for your convience as laws are different in every state. We also have the only ID theft protection that monitors all aspects of ID theft and in the event of ID theft will assign a licensed private investigator with Kroll Worldwide to do what ever it takes for as as it takes to restore your idenity to pre theft status.